A timeless elegance is created in the classic style of antique wedding gowns and floral arrangements. 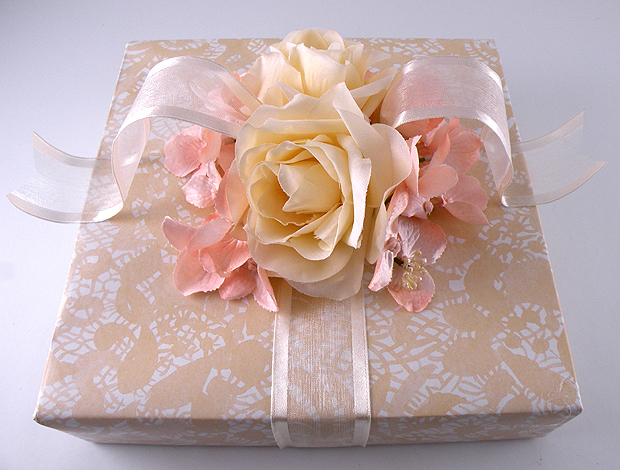 This vintage look was created with the beautiful Lace Cutworks gift wrap and light and airy cream Satin Sheer Ribbon. 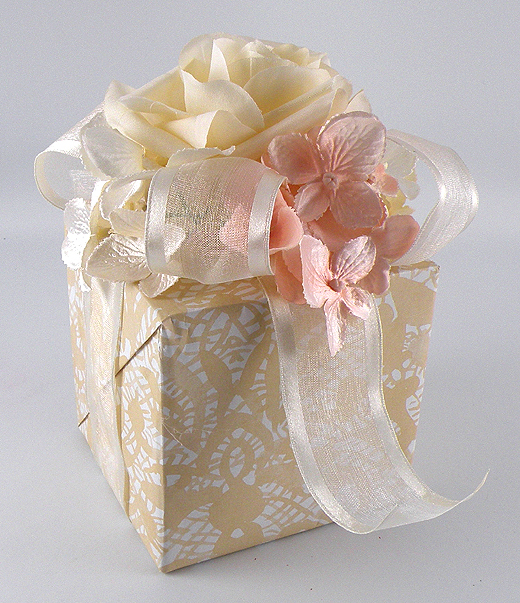 Silk flowers in matching tones are added to accent this stunning gift decoration. 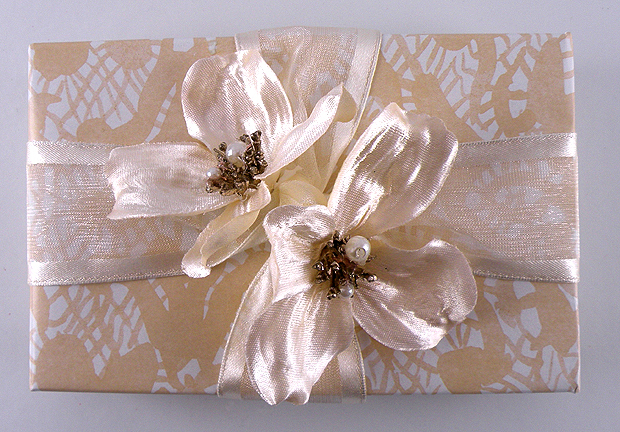 This is one of my wedding gift wrap designs I created for Nashville Wraps using their beautiful gift wrap, ribbon and boxes. Step-by-step instructions can be found here. 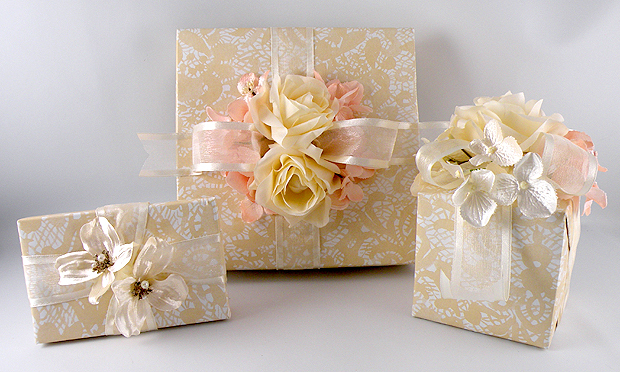 The Recycled White Gift Boxes are a nice size to decorate — they look like a wedding bouquet gift wrap. 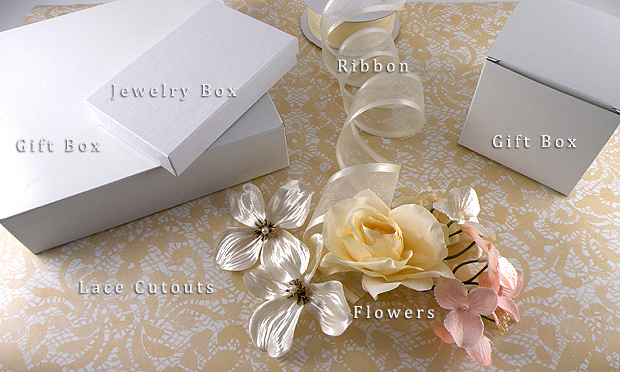 The White Jewelry Boxes are perfect for holding small gifts or gift cards. The Recycled White Gloss Gift Boxes come in various sizes and can be used to wrap larger items. This entry was posted in Gift Wrapping, gifts, gina tepper, Uncategorized, wedding and tagged bridal, flowers, Gina Tepper, Nashville wraps, vintage wedding, wedding gift design, wedding gifts, wedding presents, wedding wrap, wrapping paper, wrapping with flowers. Bookmark the permalink.